This is an electronic project with the aim of taking the user through an interesting corner of the world of linear electronics while paying tribute to one of the greats of electronic design. Though like all Boldport projects it is aesthetically pleasing, it delivers its results in the form of voltages rather than lights or sounds. Thus alongside all the usual soldering tools it is probably essential that you have a multimeter or other voltmeter to hand to fully appreciate it. The project contains a single surface-mount integrated circuit in a so-called “SOIC” (Small Outline Integrated Circuit) package. If you are daunted by the prospect of soldering an SOIC then never fear, a Google search should deliver plenty of tutorials for what is a surprisingly simple procedure. As well as the SOIC there is a power transistor, and while both semiconductor devices are fairly robust there exists a small possibility that they could succumb to damage from static electricity. Therefore we would like to suggest that you take some precautions against accidental static discharges when handling these devices. Lastly, the μA723 datasheet is an essential companion to this adventure. Make sure you have it handy. The Fairchild μA723 voltage regulator is not at first sight a particularly exciting integrated circuit. Designed by the legendary Bob Widlar and released in 1967, it should have followed the majority of its contemporaries and faded from supplier catalogues and parts lists during the 1970s as it was superseded by more capable devices. Instead it has persisted, and five decades later it can still be found in the product lists of several semiconductor companies. We’ll try to answer the question of why that is the case, and delve into its operation with a selection of circuits using it that you can try for yourselves. Have a look at the functional block diagram on page 1 of the datasheet. The 723’s internals comprise a collection of parts from which almost any voltage regulator circuit can be constructed. There is a buffered voltage reference, a comparator (labeled ‘Error Amp’), a current limit transistor, and an output transistor that is only capable of delivering a modest power level. Except for the comparator output being internally connected to the two transistors, nothing is preconfigured: the designer is required to create their own circuit and is forced to think about the internals of a voltage regulator. On the following datasheet page we see a much more detailed schematic of the internals. Normally, you wouldn’t need to follow the innards of the chip in this detail, but an interesting exercise is to identify the building blocks. The top left corner with the three resistors and two transistors, for example, is the Widlar current source. It allows the designer to achieve low currents without large value resistors, which were expensive and large as discrete components, and hard to achieve within an integrated circuit using the technology available at the time. What other blocks can you identify? The appeal of the chip then is in this presentation of a blank canvas. Whether you are learning about voltage regulators for the first time or a seasoned designer seeking to push a regulator circuit beyond the performance confines of commonly available but less flexible devices, the 723 offers the required tools to achieve your goal. Unlike other survivors from semiconductor catalogues of yore such as the NE555 timer or the μA741 op-amp it does not have applications beyond the relatively narrow field of voltage regulation, but within that field it provides such a wealth of functions that it has justified its place alongside them as a classic among integrated circuits. Today, when we build a power supply it is likely that it will include some form of switching regulator. In simple terms, an LC circuit of some form is used as an energy store fed by pulses of electricity, and regulation is achieved by adjusting the length of those pulses in response to feedback from the output voltage. In this way voltages can be changed and regulated with maximum efficiency. Though the 723 datasheet includes a switching regulator application, it’s fair to say that in 1967 a switching regulator would have been considered something of a Space Age technology. Huge advances in transistor speed as well as in materials such as the ferrite used in the inductors have given us switcher modules that cost pennies, but back then they would not have delivered the performance we are used to and would have been beyond many component budgets. Instead, a typical power supply of the day would have derived a rough DC from the mains through an iron-cored transformer and a bridge rectifier, with a large electrolytic capacitor for smoothing. The regulator, if there was one, would have been a linear design, an all-analogue affair in which regulation was achieved by varying the current flowing into the load in response to feedback from the output, and dissipating any voltage drop between rectifier and output as heat. The key component of this type of linear regulator is a comparator. This is an amplifier with two inputs, that performs the simple job of deciding whether or not the voltage on one input is higher or lower than that on the other. If one of the comparator inputs is connected to a stable reference voltage and the other to the power supply output, the answer produced by the comparator can be used to say whether the output current should be decreased, or increased. If the base of a transistor in series with the power supply output is connected to the output of our comparator comparing the two voltages, we have built a simple but effective voltage regulator. This principle forms the basis of all linear regulator circuits using the 723. We shall now move on to some real-life examples of regulators using the 723, and show how they can be built using the "Widlar" Boldport Club project. Before starting then, it’s worth taking a look at the kit itself with a quick description. The kit comprises a PCB and a pack of components that should allow you to experiment with a variety of linear regulators using the 723. It features a 723 in a surface-mount SOIC package rather than the classic 14-pin DIP. This device has been available over the years in a variety of packages from a metal can to a tiny quad flat-pack. The PCB meanwhile has been designed to be used as both a prototyping board and a base for a permanent regulator circuit. Aside from the IC footprint it also has holes, traces, and pads for placing a variety of different components and connecting them through jumper wires. There are no hard-and-fast rules as to which component might go where, and many circuits might not use all available holes. When building your circuit feel free to place components wherever you wish, as long as the connections are correct. We do recommend planning the layout before committing to it with solder. Figure 1 from the datasheet in its original form on the left and in a physical form on the right. So this circuit is a straightforward linear regulator in which the output voltage is compared with one derived from the reference via a potential divider in the form of R1 and R2. These two resistors determine the output voltage, and we have supplied a pair suitable for a 5 volt regulator, as conveniently specified in Table 1 of the datasheet. There is another resistor, R3, which is not critical but can be calculated from a formula in the datasheet. We have supplied a 4.3KΩ resistor for this part. An interesting refinement to the most basic regulators comes with Rsc, the current sense resistor. This is connected across the base and emitter of the current sense transistor, whose collector is connected to the base of the output transistor. When the voltage across Rsc reaches a point at which it starts to turn on the current sense transistor, the base of the output transistor is pulled down. This reduces the output voltage, and thus the current stays at the same level. The current sense transistor turns on with about 0.6V on its base/emitter junction, thus with a 10Ω value of Rsc the current is limited to about 60mA (using Ohm’s law). 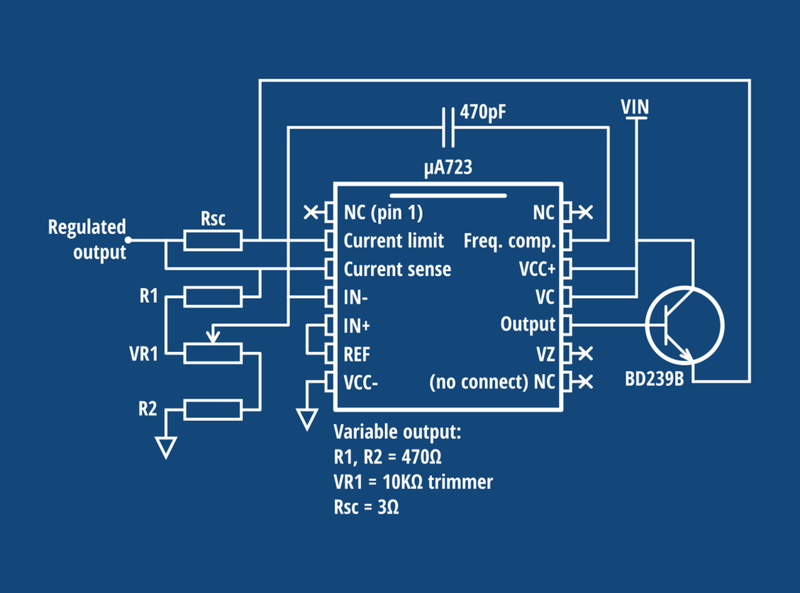 Follow this diagram to create the 5V regulated output. This is one of many ways to lay out the circuit on the PCB. How interesting can you make it? This should be a simple enough circuit to construct whether you wire the discrete components via the holes in the board or by soldering them directly to the exposed pads. A pitfall lies with R2 from ground to pin 5, it is all too easy to wire it to the wrong end of R1 on pin 6 by mistake. This yields the happy accident of the output voltage being the reference voltage plus a diode drop, or a serendipitous 7.23 volts, but is not the intended result. Modern regulators are often designed to work from a supply voltage just above their output voltage, and are usually referred to as “Low dropout” as a result. In 1967 integrated circuit regulators were in their infancy, so the 723 requires a relatively high input voltage of between 9.4 and 40 volts to keep its internal 7.15 volt reference operating (see these and other handy figures on the first table on page three of the datasheet). Your input voltage for these circuits should be within that range, and when building our versions of them we used a 12 volt input. Any voltage within the range available can be selected with careful choice of R1 and R2, so a variable supply can thus be created by replacing them with a variable resistor. This is a technique that should work with both the high and low voltage variations of the basic linear regulator circuit, we have shown you the high voltage version for voltages above 7V. A small 10KΩ trimmer (a variable resistor) is in the parts pack for this purpose, along with a pair of 470Ω resistors to place at its ends. Building this circuit should be simple enough, the fixed components share very similar placement to those in the previous circuit while the variable resistor can be placed in the appropriate set of holes to the left of the 723 and linked to the rest of the circuit by the 470Ω resistors and a piece of hook-up wire. Upon power-up you should find the output to be adjustable from somewhere just above 7V to just below whatever is the value of your input voltage. The 723’s internal transistor is only a modestly powered device, so in order for a 723 to provide juice for more demanding circuits an external transistor must be used. The 723 output drives its base directly, and its emitter feeds the current sense resistor. It is important that the pass transistor has sufficient gain to ensure that the base current drawn from the 723 for the desired output current does not exceed the 723’s 150mA maximum output current as specified in the datasheet. Larger current outputs may therefore adopt a Darlington pair configuration to reduce the current from the 723. We have supplied a BD239B NPN pass transistor in a TO-220 package and a 3Ω current sense resistor to deliver a current limit of about 200mA. Building this circuit should present few challenges to someone who has already made the previous two circuits. The power transistor should fit in the set of holes at the top right of the board, and care should be taken to observe its correct connection. In a series linear regulator such as these, the energy involved with the voltage drop between input and output at whatever current is being drawn will be dissipated as heat in the output transistor. Even at the fairly modest 200mA current limit set by that 3Ω resistor, there can be enough energy involved to heat the transistor to the point at which it fails. You can easily demonstrate this using the circuit, when you short its output through a suitable ammeter you will see the current remain stable at just above 200mA but if you place a finger on the transistor you will find it rapidly heats up. We couldn’t hold a finger on the transistor for more than 15s in this configuration, and we would strongly recommend that you do not operate it in this way for longer than that time. The solution to allowing higher currents without destroying the transistor is to add a heatsink, a device designed to conduct the heat away from the transistor and dissipate it. And since there are a bewildering array of heatsinks available it makes sense to have some knowledge of the factors surrounding heatsink selection. The efficiency of heat transfer from the semiconductor junction to the atmosphere is expressed through a thermal resistance in °C/W (degrees in Celsius per Watt), where for example a heatsink with a 10 °C/W rating will rise in temperature by 10 degrees for every watt of power that pass through it. Commercial heatsinks will all provide this figure as part of their data sheet, and even semiconductor packages will often include it in theirs. The TO-220 package of the BD239B included in the kit of parts for example has a thermal resistance to the atmosphere quoted in its datasheet of 63 °C/W, meaning that with no attached heatsink it will rise in temperature by 63 degrees for every watt of power it dissipates. The full calculation takes into account such factors as the room temperature or the efficiency of the bond between the transistor and the heatsink, but for our purposes here a more back-of-an-envelope calculation should be sufficient to gain an angle upon it. Assuming our regulator is taking a 12V input and is shorted out with the current limiter holding it to 200mA, we can therefore calculate a temperature for our experiment holding a finger on it. The power P=I*V, is 0.2Ax12V, or 2.4W, therefore the temperature should eventually reach 2.4x63, or 151.2 degrees. The datasheet shows a maximum junction temperature of 150 degrees for the device, so running continuously in that configuration would cause it to fail. Selecting typical clip-on TO-220 heatsinks, we find a variety of parts with quoted thermal resistances of around 25 °C/W. If we were to attach one of these to our transistor and repeat the calculation, we would arrive at a temperature of 2.4x25°C, or about 60 degrees. It would still run quite warm with such a heatsink, but not to the point at which the transistor would fail. The μA723 is a linear regulator kit-of-parts as we have described, but its operation is not solely limited to that task. As you might expect, as an analogue integrated circuit it can be configured as an oscillator with the application of some feedback, and the resulting oscillations can be pulse-width-modulated according to the difference between the voltages on the input of its comparator. It can then be used to drive a straightforward buck converter with a suitably fast diode and inductor combination, and you can find the circuit diagram in figure 9 of the data sheet. 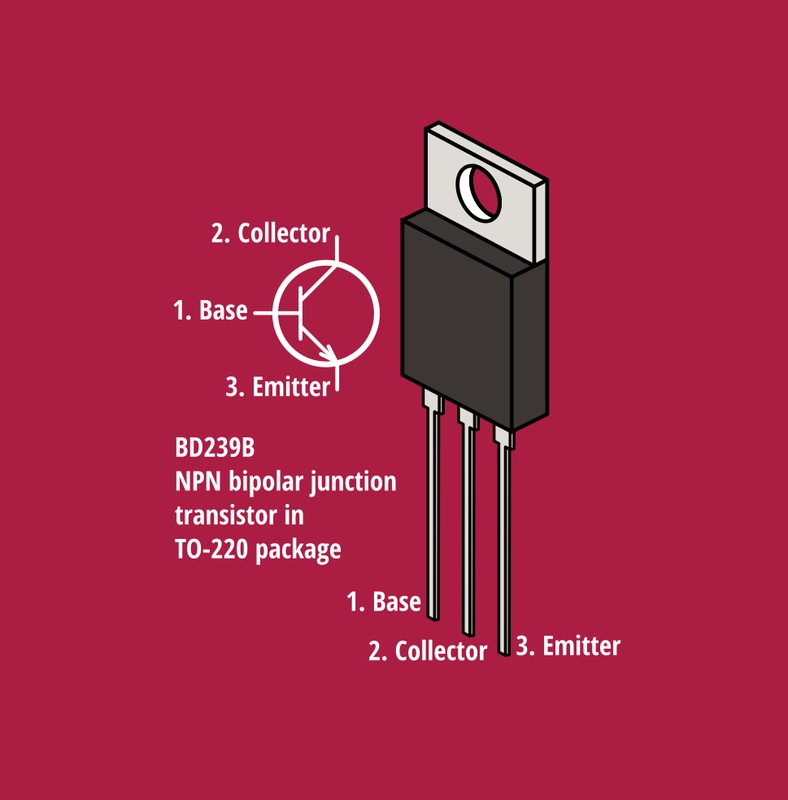 (The Texas Instruments μA723 data sheet has an error in this case, the collectors of both transistors should be connected together. Compare with the TI LM723 sheet.) It’s by no means the circuit you would choose for a switching regulator today as far better switching regulator controllers exist, but it must have been a particularly impressive application back in 1967. The Widlar kit does not include all the components to make this circuit, but it is included here simply to demonstrate the versatility of the device. The circuit uses a pair of PNP transistors, a fast rectifier diode, and a small inductor. The discrete semiconductors from the 1967 datasheet have long ago been superseded, but fortunately over the decades since we have seen a multitude of better and faster devices replace them. If the more up-to-date alternatives on the most recent Texas Instruments data sheet are not available then you should have few problems finding equivalents. The inductor is specified on the data sheet as a particular number of turns on a specific core, but yet again the benefits of the electronic component supply chain are in our favour and there are plenty of 1.2mH inductors on the market designed specifically for use in such converters. We used a TDK wire-ended component for ours. The construction of the switching regulator follows a similar pattern to those of the linear regulators. Care will have to be given to the order of the leads on the transistors and to place the diode in the right orientation, but otherwise it is simply a case of placement of resistors. The same values for the potential divider can be used as with the linear regulators, so you can use the same resistors as in the earlier example to make a 5 volt regulator. With this project you should have created a perfectly serviceable voltage regulator that can serve as the nucleus of a useful bench power supply should you choose to take it further. Searching the Internet will lead you to plenty of projects showing suitable circuits containing a mains transformer, bridge rectifier, and large smoothing capacitor to deliver a rough DC supply as your input voltage. If you take this path, we would suggest that you build either of the linear regulator circuits with the variable resistor option, replacing the trimmer with a full-size potentiometer which can be mounted on the front panel of any enclosure you place the circuit in. If you produce the version using the pass transistor you will definitely need a suitably large heatsink as explained above, and you may wish to pick a current sense resistor to give you a higher current limit. A popular choice is a 1Ω resistor with a power rating of greater than 0.5W, this delivers a 600mA current limit which is high enough to be useful but low enough to cause little harm in the event of a short circuit. Please exercise caution with the mains voltage wiring as you build it, and enjoy a useful bench instrument which should last you for many years. If you are building this kit, there is a strong chance that somewhere close to your bench you have a copy of The Art Of Electronics, the seminal undergraduate text by Paul Horowitz and Winfield Hill. First published in 1980, with a third edition published in 2015, it remains a text that electronic engineers do not discard at the end of their university courses. We know engineers still using their over-30-year-old first editions as works of reference, it’s that useful a book. As you would expect from an electronics text book, Horowitz and Hill has an extremely useful chapter on power supplies and regulators. Because of the handy kit of regulator parts it contains, the μA723 is used as the teaching example by the book. First published only 13 years after the chip’s debut, this seems to be a damning indictment of its future prospects, and nine years later in the second edition the paragraph appears unchanged. This remarkable component has confounded even the seminal text in its field, though it’s fair to observe that to have so many engineers learn about regulators in this book through the one chip certainly does no harm to its prospects. Any references to a data sheet in this document relate to the Texas Instruments SLVS057D document for the μA723. There are many 723 data sheets from the multiple sources for the chip which contain similar information, and to seek them out is to both explore five decades of the semiconductor industry’s corporate history and examine the way that dissemination of information to engineers has evolved over that time. Our earliest copy comes from the original source, the Internet Archive holds a Fairchild Semiconductor linear integrated circuits data book from the early 1970s (see section 5-2). It sits alongside some other familiar Fairchild greats such as the μA7805 and μA741, but also in the same book as drivers for magnetic core memory, AM car radio chips, and colour TV decoders. In the days before easy access to any data sheet via the Internet, these books that could be had from semiconductor sales reps were highly prized and much read, spawning an intimate familiarity with a manufacturer’s range that is much more difficult to gain from a website. Fairchild Semiconductor passed through a variety of owners over the decades, first Schlumberger in the late 1970s, then National Semiconductor in the following decade, then independent again, and finally disappearing into the ON Semiconductor behemoth. ON Semi do not appear to list the μA723 as a current product, but through Fairchild’s corporate history there are sheets from the National Semiconductor days to be found. The μA723 production from Fairchild and its descendants form only half the story, for the chip was produced by many secondary manufacturers. Here a cursory Google search will find data sheets from ST, Texas Instruments, and JRC among others. TI even have two completely different data sheets for two different part numbers, a μA723 and an LM723, that have probably arrived in the TI empire by the means of different corporate acquisitions. Reading the different versions of the same data sheet from so many different sources over the years it has been extremely interesting to spot the differences between them, and uncover quite a few errata that have crept in as they have passed through many corporate publishing departments. It is perhaps unfair to single out the worst offenders as their offerings are no longer currently manufactured, but we have found missing figures referenced from text, figures with the wrong labels, and schematics with glaring mistakes. Even the current Texas Instruments μA723 sheet that we have used as a reference for this document has some minor mistakes in the schematic for the switching regulator, the collectors of the two transistors should be connected to each other. 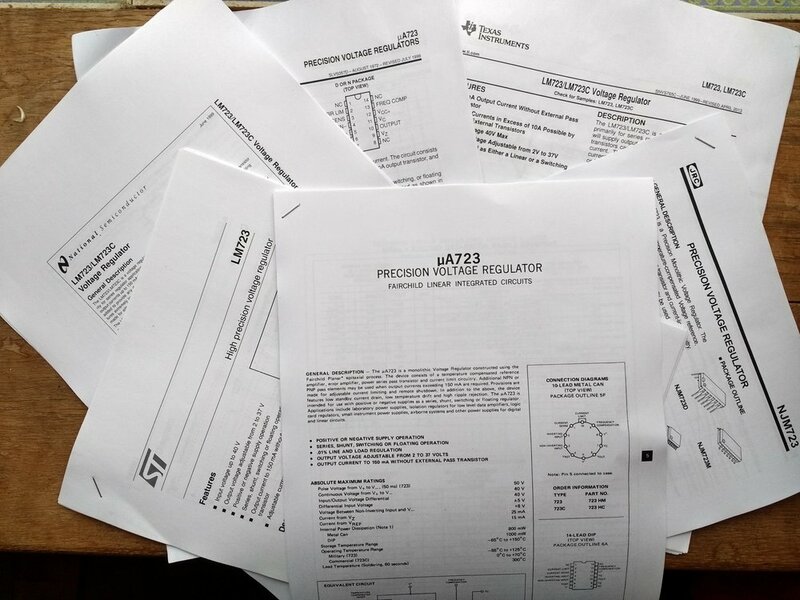 So take a while to lose yourself in the datasheet for the μA723, but be careful, some sheets are better than others! The "Widlar" project pays tribute to the designer of the μA723, Bob Widlar. Widlar was a person whose legacy is defined not only by his huge contribution to the art of linear integrated circuit design, but also by his larger-than-life reputation as an eccentric and prankster. The picture of him that surfaces most often is one of a bearded man smoking a cigarette, holding a beer, and giving the photographer the finger, with the caption expressing his contempt for digital electronics: “Every idiot can count to one!”. His career with Fairchild began in the early 1960s, and he brought to integrated circuit design an approach that treated it as an art in itself rather than simply a miniaturisation of existing full-size designs. To overcome some limitations involving passive components that could not be replicated on silicon he developed circuits which have since become the standard components of linear integrated circuit design. Some of them bear his name, for example the Widlar bandgap reference, or the Widlar current source. While at Fairchild and during his later time at National Semiconductor, he was responsible for the creation of a variety of groundbreaking chips, some of which like the μA723 were destined to become defining standard components of their class. The μA702 of 1964 for example was the first monolithic op-amp to market, with the then-revolutionary feature of integrating all components except the optional frequency compensation parts with no hybrid construction on the same piece of silicon. Following his move to National Semiconductor he continued with the first 3-terminal voltage regulators, the LM100 series, and then the first op-amp requiring only a single capacitor for frequency compensation, the LM101. In 1970 he left National Semiconductor and famously became a recluse in Mexico, before returning to the industry a few years later as a contractor. He spent some time with Linear Technology in the early 1980s, and finally passed away in 1991 of a heart attack aged 53 while jogging near his Mexican home. If Widlar’s professional achievements tell us about his career, it is the larger-than-life legends that survive which tell us about the man himself. There is a famous episode in which he brought a sheep to the National Semiconductor offices and tethered it on the slightly unkempt lawn, there are tales of his wild drinking escapades, and of his electronic devices designed to annoy noisy colleagues. That we are celebrating him with a kit so many decades later probably owes as much to this aspect of his character as it does to his work, it is probable that only when the semiconductor industry was in its infancy could he have found such a place within it. This article was written by Jenny List with contributions from Saar Drimer. It is licensed under the CC BY-SA 4.0.